Yuko Kavaguti and Alexander Smirnov of Russia perform their Short Program at 2014 Skate America. 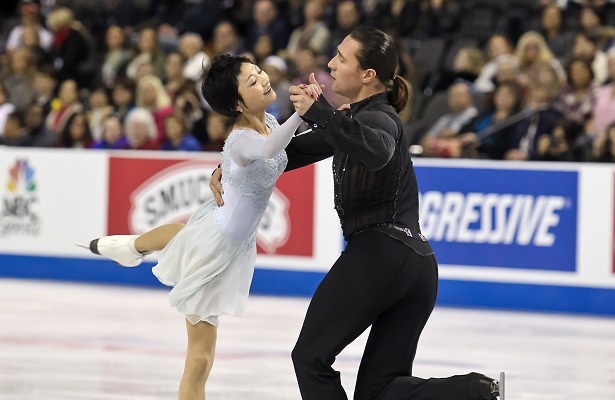 Russian pair skaters Yuko Kavaguti and Alexander Smirnov have come back strong after missing last season due to Smirnov’s devastating knee injury, and have proven that it is too early to count them out. In October 2013, Smirnov ruptured ligaments in his right knee on a fall in a local competition in Saint Petersburg, Russia. They withdrew from both Grand Prix events in hopes of recovering in enough time for the Olympic Games or the World Figure Skating Championships, however, it was not in the cards and the team ended up sitting out the entire season. Not many expected the veteran skaters to return after such a serious injury, yet they came back with a bang. Kavaguti, 33, and Smirnov, 30, won their first event in 18 months at Nebelhorn Trophy earlier this fall, and followed up with another win at Skate America while setting a new personal best of 140.00 points in the free skate. The Japanese-Russian duo went on to claim a silver medal at NHK Trophy and qualified for the Grand Prix Final. Nerves struck the team in Barcelona, Spain, however, and Kavaguti missed the triple toe and throw triple loop in the short program. Even with a solid free skate that included their quad throw Salchow, the two-time World bronze medalists were not able to move up from sixth place. “The Final never was our favorite competition,” noted Smirnov. Indeed, in the six times they participated in the event, they only managed one podium finish—third place—in 2011. The Final was meant to be a stepping stone towards Russian Nationals, however, in Sochi not everything went according to plan. Kavaguti and Smirnov sat in second following a clean short program to “Meditation” from the opera Thais by Jules Massenet, and were very pleased with their performance. The 2010 European champions gave away their chance for victory (and a fourth National title) in their dramatic long program to Tchaikovski’s Manfred Symphony when they made mistakes in their solo jumps. She singled a toeloop and struggled with the double Axel, while he put his hand down on the triple toe. Nevertheless, their quad throw Salchow was a beauty. Kavaguti and Smirnov dropped to third, behind Evgenia Tarasova and Vladimir Morozov, while Ksenia Stolbova and Fedor Klimov defended their title. Smirnov was not happy with the mistakes and felt they could have easily fought for first place. The Russian Skating Federation named Kavaguti and Smirnov to the team for Europeans, and in Stockholm the skaters want to fight again. The quad throw is a powerful weapon, and the team from St. Petersburg has improved their consistency on it, as well as other elements. Additionally, their programs, which were choreographed by Peter Tchernyshev, have been well-received. The short program was Kavaguti’s preference. While “Meditation” is soft and light, “Manfred” is a very powerful piece of music. Not all skaters can pull off such dramatic music, however, Kavaguti and Smirnov seem to thrive on it. They display strong emotions on the ice and have really grown as performers. The 2010 European Champions feel that skating in shows in Korea last spring helped them to develop their presentation skills and that the break motivated them. Following the shows in Korea, the team sat down with long-time coach Tamara Moskvina and decided to return to competing. The 2010 Olympians want to do well at Europeans, not only to prove that they are still competitive, but also to secure a spot on the World team. While Olympic champions Tatiana Volosozhar and Maxim Trankov might come back if he is fully recovered from his shoulder injury, Kavaguti and Smirnov are currently number three on the team.